The Year of Engineering will see government and industry tackle a major skills gap and inspire the engineers of tomorrow. Schoolchildren meeting engineers at an Inspiring the Future event organised by Year of Engineering partner Education and Employers. A pioneering campaign to transform the way young people see engineering and boost numbers entering the profession has been launched today (15 January 2018). Ministers from across government are joining forces with engineers, industry experts and hundreds of businesses to change perceptions around engineering – and highlight the scale of opportunity that careers in the industry hold for young people in the UK. 2018 is officially the Year of Engineering and will see a national drive in all corners of the country to inspire the young people who will shape our future. Engineering is one of the most productive sectors in the UK, but a shortfall of 20,000 engineering graduates every year is damaging growth. There is also widespread misunderstanding of engineering among young people and their parents and a lack of diversity in the sector – the workforce is 91% male and 94% white. The new campaign is aimed at filling those gaps and changing misconceptions, and will see government and around 1,000 partners deliver a million inspiring experiences of engineering for young people, parents and teachers. Engineers – whether they are working on cutting-edge technology in aerospace, energy or artificial intelligence – are vital to the lifeblood of our economy. We want to show young people and their parents the immense creativity, opportunity and value of the profession. 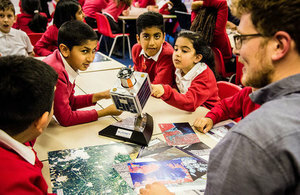 By bringing them face to face with engineering role models and achievements we can send a clear message that engineering careers are a chance for all young people, regardless of gender, ethnicity or social background, to shape the future of this country and have a real impact on the lives of those around them. I want to see everyone whatever their background, wherever they live to have a chance to get a rewarding career or job in engineering whether they come via a technical or academic route. The Year of Engineering gives us a great opportunity to work together with business to inspire a new generation of world class engineers. We want to build the science, technology, engineering and mathematics skills that we need for a growing economy, as highlighted in the government’s Industrial Strategy. The Year of Engineering will be a fantastic opportunity to inspire others to take a fresh look at engineering and show the range of opportunities there are for training and jobs in this sector. We look forward to showcasing the role engineers have played in creating such an amazing project before the Elizabeth line opens to passengers at the end of 2018. Encouraging more young people to enter the engineering profession is essential to ensure the growth and development of new technologies and businesses in the UK. At Ocado we build the world’s most advanced automated warehouses for online grocery, and we hope our involvement in this campaign will offer young people from diverse backgrounds a real insight into the exciting and rewarding life of an engineer.